I was commissioned by Stranger & Stranger to contribute 3 cards to their annual promotional packet, The Ultimate Deck. A transformation playing card is a type of playing card where an artist incorporates the pips of the non-face cards into an artistic design. I did the King of Spades as a bull who's horns make the shape of a spade, a Jack of Diamonds where I used a Jackal to represent the Jack, and the Four of Clubs which shows a lemur sitting in an orange tree; the groups of oranges make the shapes of clubs. 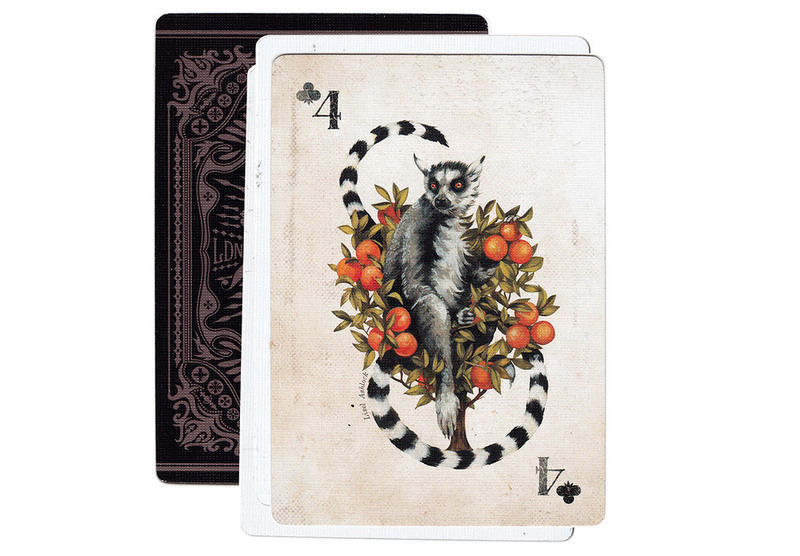 The cards came in an impeccably designed box, with lettering and design gilded in gold, and the card decks themselves in small velvet pouches. These guys never cease to amaze me!